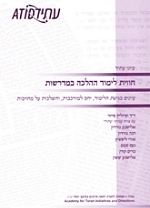 This Hebrew monograph in the "Notes From ATID" series explores differing approaches to the study of halakhah (Jewish law) in four Israeli midrashot (post-high school seminaries for women). Concerned with how young women understand and relate to complexity within the ritual-legal system, the study is based on extensive interviews with students, alumna, and teachers. Concerned with exploring the basis of religious commitment, the authors look at the implications of their findings for improved methods of instruction, and contemporary educational needs. Dr. Caroline Peyser, a senior staff member at ATID, is a clinical psychologist in private practice in Jerusalem, and served as an instructor of Talmud at Midreshet Lindenbaum from 1994-2003. Her previous work for ATID, "Body and Soul" explored eating disorders in a Jewish educational setting. This monograph was co-authored with a team of ATID Fellows: Miriam Coren, Anne Gordon, Elisheva Gordon, Ori Lifshitz, Noam Samet, and Elisheva Sasson.